This tri has excellent organisation with stewards and officials who know how to advise racers. You have to turn up at Bath University the day before to sign in where you get really detailed info about the event and route. The routes are well sign posted but you have to be aware that the cycle and run routes are similar and you don’t want to get mixed up. You also get lots of freebies! Unfortunately the organisation for spectators isn’t so good. More on that later…. The event starts the 50m pool at Bath Uni, which is based a couple of miles outside of the city centre. You then hop on the bike and head out towards Castle Coombe (a neighbouring village) and the run takes place in the same direction ending in the grounds of the uni. After doing lots sea swims I do find swimming pool starts a bit dull but it’s a good pool as you can imagine at a top sports hub like Bath. The Uni is used for lots of top events and many top class athletes train there. The cycle is pretty epic and there is some stunning hilly scenery to soak in if you’re not in too much pain on the bike. There is another Bath tri that starts in the city centre too – which probably is also pretty cool scenery-wise. Lots of spectators turn up to watch this tri. There are seats around the pool for the swim and there’s a track with a big inflatable finishing line at the end where people all gather to cheer you on. Out on the cycle and most of the run you are on your own, but it’s a busy triathlon so normally fellow competitors are there to keep you going. The swim is the standard sprint distance in the pool so fairly easy. The lanes are quite busy so just try and overtake where you can. The cycle is by far the toughest bit with some huge climbs. The distance isn’t the problem, it’s just never flat. The run is average difficulty wise – fairly flat with a few different types of terrain. Vote below in our poll to have your say on how tough this tri is. Bath is a great city so make the most of the event and stick around for an evening. Even better stay for the weekend and if you’re feeling brave try out some of the student bars not far from the university. For tourism info click here. I wasn’t signed up to do this tri but a friend pulled out so I filled his shoes just a week before doing it. It’s busy and sells out early so it was good to get a place. 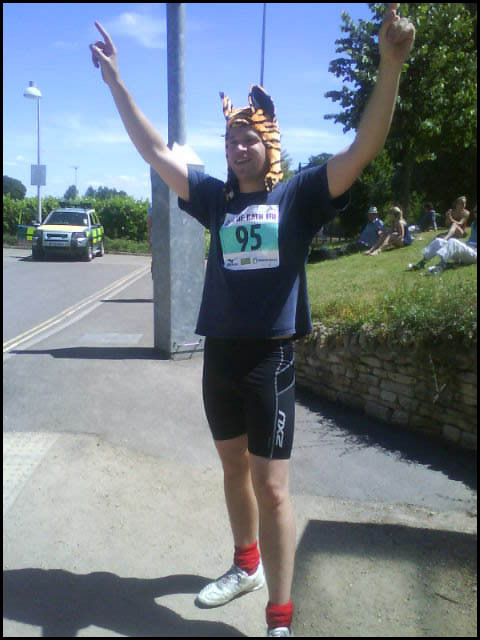 My race started mid-morning which was a bit of a change – a lie-in before a tri – unheard of! The swim was fine but being my strongest event, it’s a shame I was in a slow wave. I had to keep over-taking in a very busy lane, which slowed me down and probably pissed off others. The stewards were nice when I got out the pool and told me when I got out I was fast so should have been in a different wave – that gave me a confidence (and ego!)boost. Then I headed out on the bike. Started well. Sunny, flat, wind through my hair. Then came th e first climb, then the next, and the next! 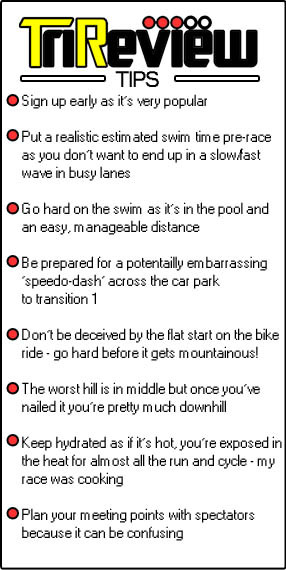 It’s an impressive cycle and there are obviously as many downhill stints as uphill as you do go back on yourself. You also get to see people coming the other way, dying. Downhill isn’t my strongest as I never pick up enough speed so my cycle time was pretty average. But I was pretty strong in the run as there were lots of crowds to cheer me on. 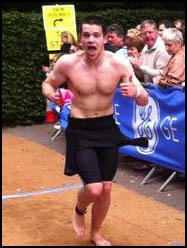 The announcer shouted out the name of my mate as I crossed the line, which was also quite amusing. My parents and girlfriend came to watch. They saw my swim. Then went out to the transition to see me come in on the bike. But they never found me. I then finished the whole race and found them on the other side of the campus still waiting for me to finish the bike. I tapped them on the shoulder to say – who are you waiting for??? It was like the scene in The Last Crusade where everyone is looking for Indy over the cliff edge. But overall a good tri with a boring swim, a challenging cycle and a fun run!